Dazzle someone special with Brilliance. 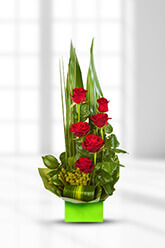 This stunning boxed arrangement of long stemmed premium Roses elegantly set in tiers and presented with Bersilia Berry and Tropical Greenery will impress remarkably with its elegance and refinement.Add to the pleasure of sending flowers, not to mention receiving them, by sending a bottle of Red Wine along-side these elegant Red Roses. A little extra that we highly recommend. Just simple, excellent service - Lovely flowers - thank you. She loved the flowers! Thank you very much for the quick service and the beautiful arrangement of fresh flowers. very happy with the service. Fast same day delivery from Sydney to Penang. My order was delivered on time, flowers exactly as ordered. Well Done. Excellent service,delivered on time and great product.Will definitely use zFlowers.com again. Service was excellent, fast,efficient and very easy to order online. I am one of those typical males that don't give much thought to buying flowers and not computer savvy but this site made it easy,simple to buy..not to mention my Mrs was overwhelmed by the flowers..and so am I..great work! !